It’s Not Too Late to Start Saving! 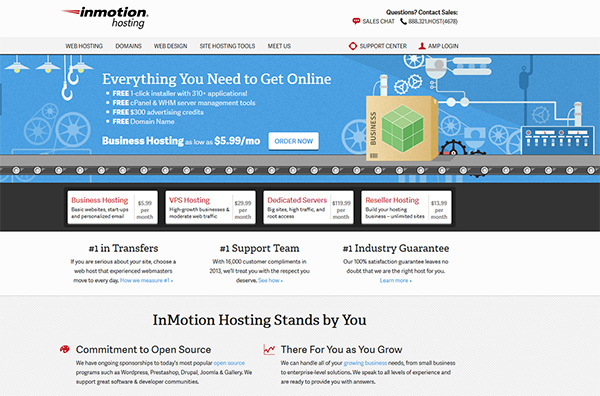 Offering a 90-day full money-back guarantee, InMotion puts its reputation as a powerful webhost on the line, while helping your presence grow online. Starting at $5.99/month, InMotion could save you money right off the bat, giving you a free domain name to help build the site you’ve always dreamed of. In terms of ease of use, InMotion could be one of the simplest and most versatile interfaces around today, offering 1-click installs on over 300 of the Internet’s favorite plugins. If you’re looking for advanced features and true performance, though, InMotion promises the maxed-out speed and reliable servers you’ve been looking for. If you’ve dealt with cut-corner webhosts before, it may be time to seriously consider the powerful and simple offerings from InMotion. If you have no clue where to start with your website, InMotion can offer you some serious help. With a template-based website building tool, you can quickly and easily create a website in a short period of time. 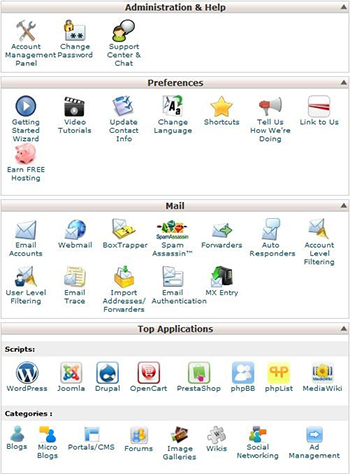 If you’re more hands on, you can always design your site using InMotion’s simple cPanel, which features 1-click installs of over 310 plugins. You’ll also find that setting up a spam safe email account for your domain is relatively straight forward, and can usually be completed in 5 minutes with or without InMotion’s helpful tutorial. With all its power, InMotion is well-equipped to launch the online kingdom you’ve always imagined. For instance, each package allows for multiple websites, as well as parked domains and subdomains, which can create a more content-rich experience. Each and every package still offers unlimited storage and bandwidth, though, meaning that your visitors won’t be turned away from your site. With automatic, free site backups, you’ll also never have to worry about losing info on your website, thanks to InMotion’s intuitive functionality. For one of the biggest selections of 3rd party plugins to make your site something special, you don’t need to look any further than InMotion. With over 300 of the best software apps, you’ll be able to utilize all of your favorite content management interfaces, such as WordPress, Joomla, Drupal and Moodle. If you’re trying to develop an eCommerce site, InMotion can help you sell your goods and services with as little trouble as possible. According to InMotion, the company can get you online and selling within minutes with its intuitive features. InMotion even offers you multiple shopping cart options, such as PrestaShop, Open Cart and Magento. Simply having an online store, however, won’t really do you much good if no one knows about it. Fortunately, InMotion helps you grow your company, starting with $275 in ad credits on the most popular search engines on the internet. For instance, you can receive a $100 credit by spending $25 on Google AdWords, which could essentially help you rank on the most popular site on the internet. In case you have a problem during your term with InMotion, you’ll have access to industry-leading support 24/7 via phone, chat or email. For all of your needs, InMotion’s helpful support staff is always close at hand. But, if you prefer to figure things out at your own speed, you’ll find lots of material to help you learn on InMotion’s support center. With FAQs, you can get your bearings on some webhosting basics, while email and website tutorials can help you by going step-by-step through some higher level concepts. InMotion even hosts Google Hangouts, covering diverse and interesting topics related to common concerns for webmasters. Though InMotion offers a huge variety of packages to help meet the needs of all of its customers, you can always test out the Launch plan if you’re not sure where to start. At only $5.99/month, you’ll still get a free domain and template-based builder to help you get started. If you find yourself wanting more, then the Power package is definitely a reasonable solution. In fact, for only $2 more ($7.99/month), you’ll double up on total resources, meaning your site will be even more impressive for your visitors. For larger plans, or to host more domains, be sure to check out InMotion’s extensive offerings today. For the power to help your website really take off, you have to feel confident in the abilities of your webhost. 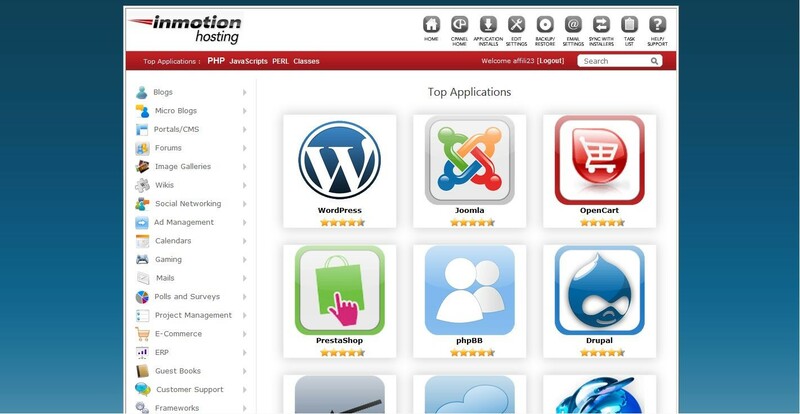 InMotion is the real deal, giving you several opportunities to succeed in the webhosting arena. If you want to manage your content a certain way, InMotion provides over 300 of the most impressive 3rd party softwares available today. Also offering 24/7 support to all of its webmasters, you should be able to find the help you need when you need it, day or night. With unlimited storage and site transfer, you’ll never have to worry about the size of the site you build or how many visitors you attract. Which is perfect, because with $275 in available advertising credits, you may be developing quite a few fans. The rankings and ratings expressed on this site are the opinion of WebsiteHostingCompanies.com and are subject to change due to popularity, price, special offers, current events and other factors related to each ranked company. Our reviews and rankings are designed to help consumers make informed purchasing decisions. We accept compensation from reviewed companies in order to provide our users with this free valuable service. All of our picks offer a money back guarantee. You don't want to get stuck in a contract that you can't get out of. Most of our picks offer a free domain name. You shouldn't have to pay for a domain name separately. Most of our picks offer an uptime guarantee. Downtime could cost your business money and frustrate your visitors. Copyright © 2019 WebsiteHostingCompanies.com. All Rights Reserved.